One of the more powerful visualization websites I have seen recently is called “Healthymagination” created by GE. 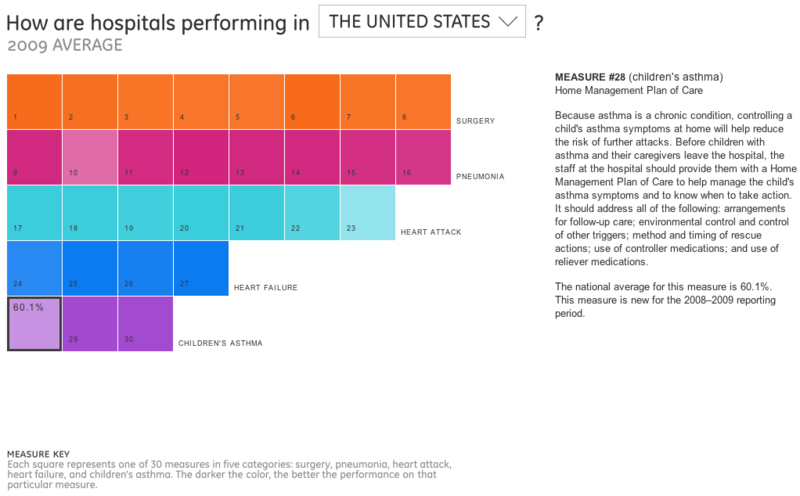 It features about 2 dozen visualizations, most of them interactive, on healthcare related topics such as Cost of Getting Sick, Heart Disease Myths vs. Facts, U.S. Health Profiles by State and County, leading Causes of Death etc. “At GE, we believe data visualization is a powerful way to simplify complexity. These are built using the Visualizing Player tool from the Visualizing.Org community, which we covered in a previous Blog post here. 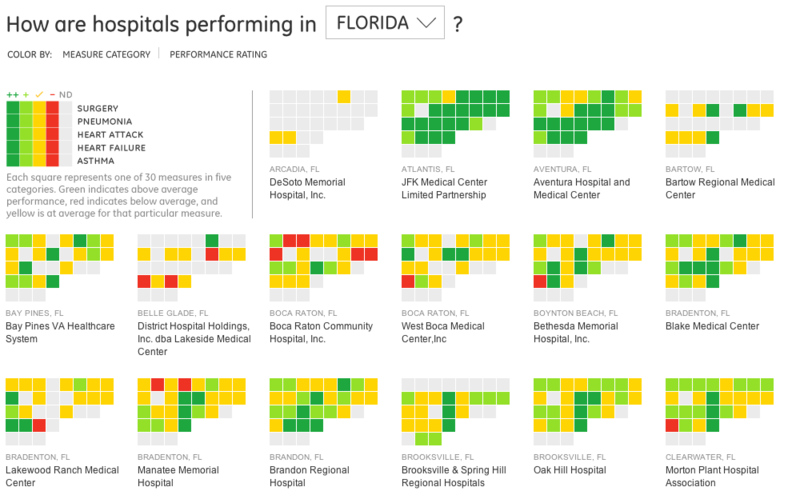 One visualization I found particularly useful shows hospital quality. Imagine you just moved to a new area and want to find out which are good nearby hospitals. How would you find out? Ask friends? Ask your doctor? Try one and switch if you have a bad experience? In most cases, you would not base your decision on a lot of data, or at best a small set of anecdotal experience. It has only one red measure, here on Heart Disease Discharge Instructions. From the legend on the right you can learn what this performance measure captures and that the national average is 86.6%. Hovering with the mouse over the red cell shows the score for this particular hospital, here 68.7%. As a patient you can use such data to obtain additional information if you or one of your loved ones has been treated for heart disease at this hospital. From this chart you can see that for example regarding Children’s Asthma, the in-patient measures are near 100% and very good, whereas the home management plans (what to do after going home) are only at 60%. Whether this indicates a general pattern – hospitals perform lower on discharge instructions than on in-patient care – would need to be validated across more than just two arbitrary selected examples. 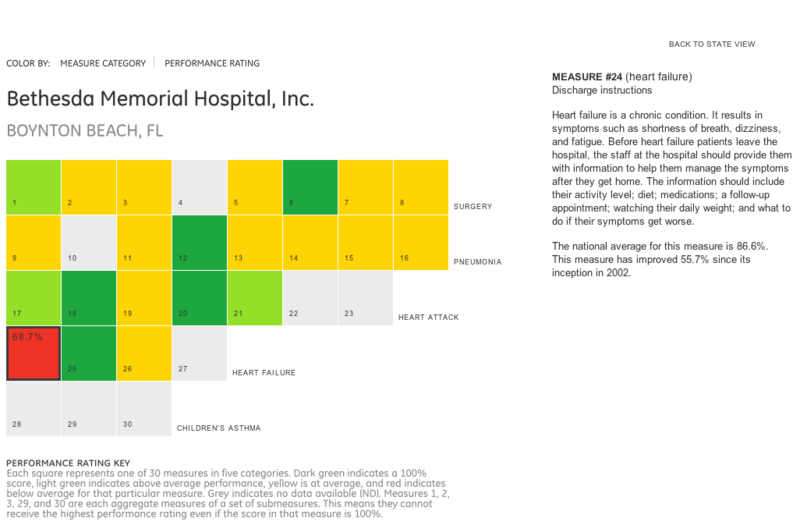 But in any event, this is a classic example of how the Internet and especially interactive visualizations based on recent and public data empowers the consumer in all areas, especially in Healthcare.